Video provided courtesy of Be The Match®, operated by the National Marrow Donor Program®. The upcoming birth of your child could save another person’s life. By donating your baby’s umbilical cord blood to a public cord blood bank, you can give hope to someone with a life-threatening disease. When you deliver your child at St. Joseph Hospital, you have the opportunity to donate umbilical cord blood to the cord blood bank at CHOC Children’s, the only hospital in Orange County to accept and store public cord blood donations. There is no cost to donate cord blood. Umbilical cord blood is the blood that remains in the placenta and the umbilical cord following birth. CHOC’s cord blood bank provides cord blood to anyone who needs it – both children and adults — which means you could be saving the life of someone anywhere in the world. Donations kept at CHOC’s cord blood bank have been transferred to more than a dozen countries across four continents. Transplanting the cells from donated cord blood offers hope to many patients being treated for many diseases, such as cancer, leukemia, certain hereditary diseases and red blood cell disorders. Donations made to public banks like CHOC are listed confidentially in the registry database of Be The Match®, operated by the National Marrow Donor Program®, where physicians can search for cord blood that is a match for a patient. The donated cord blood is then transferred to the hospital where the transplant will take place. Birthing plans, or labor and delivery, are not affected in any way by choosing to donate. The collection procedure is non-invasive and completely safe for both you and your baby, and nothing will be done to the baby. Cord blood is collected immediately following birth from the umbilical cord — not your baby – after the umbilical cord has been clamped and cut. You still choose who cuts your baby’s umbilical cord. Umbilical cord blood is the blood that remains in the placenta and the umbilical cord following birth. It is usually discarded. How does donated cord blood help others? Blood from the umbilical cord contains cells that can repair and restore an immune system damaged by treatments required for cancer, anemia and other life-threatening diseases. Traditionally, these patients have relied on bone marrow transplants. However, cord blood is more readily available, easier to collect and more affordable. Cord blood is also more likely to be accepted by the patient than bone marrow since cord blood cells are immature. Cord blood collected by the CHOC Cord Blood Bank is listed in the registry database of Be The Match®, operated by the National Marrow Donor Program®National Marrow Donor Program (NMDP). This makes it available to anyone, worldwide, who is in need of a lifesaving transplant. The cord blood is collected immediately following the birth of your baby. The cord will be cut – the father or anyone else the mother chooses can still do this -- and clamped. When the placenta is delivered, the umbilical cord and placenta are given to a CHOC cord blood bank staff member who will collect the cord blood. Does donating cord blood affect my birthing process or my baby? No. The collection of cord blood will not change the birthing process in any way, and blood is not taken from your baby. Nothing will be done to the baby. The collection procedure is non-invasive and completely safe for both you and your baby. If you have donated cord blood, a staff member from the CHOC cord blood bank will contact you after delivery. If the donated cord blood meets minimum volume and cell count levels, an informed consent and medical history screening will be completed. A blood sample (about three tablespoons) will also be taken from your arm for infectious disease testing to ensure that donated cord blood is as safe as possible to the recipient. Is there any cost to donate cord blood? Your baby’s cord blood is never identified by name, only a number. Your name or your child’s name are never shared so your baby’s privacy is protected now and for life. What about keeping the cord blood for my child or family? Public cord blood banking is different from private cord blood banking. Private banking is a paid service that allows families to store their baby’s cord blood in case their own baby or other family member needs it in the future. The decision to collect and store cord blood specifically for your child is an individual one. The CHOC cord blood bank does offer a “directed” service in which we will collect, process, test, and store your baby’s cord blood for a fee. The cord blood will exactly match your expected child. Siblings from the same parents have a 25 percent chance of matching each other. It is unknown if your child or a sibling will ever need the cord blood or what future technology will be discovered for the potential use of stem cells to treat diseases. Only you can decide if this is something that you want to do. If you would like more information or to request this service, please call (714)509-4335. What happens to my cord blood if I choose not to donate or store it privately? Cord blood not donated to a public bank or stored privately (for a fee) is discarded. 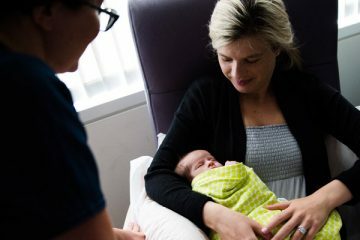 A pregnant mother who is delivering their child at St. Joseph Hospital in Orange, may sign up to donate cord blood prior to delivery or once she has checked into the hospital to deliver. To learn how a donation of umbilical cord blood can make an amazing difference in someone else’s life, please call the CHOC cord blood bank at (714) 509-4335. We will review the program with you and answer any questions.